Variety of Sound and Tokyo Dawn Labs. Development teams that are famous for delivering plugins for little to no cost to the end user at a standard that would make larger companies overwork their PR teams for months on end. A couple of months ago they released their first collaborative effort, the snappily named TDR VOS Slick EQ. It was free and made some relatively big waves in production and engineering circles. They have now released the Gentleman’s Edition. This is different in so much as it now costs €30 but it also improves on the free version in some significant ways. You know get five EQ models – British, American, Soviet, Japanese and German – rather than four, the HP filter now comes with an optional “Bump” and you also get an LP filter with two slopes and a Tilt filter with an optional “V” mode, six output stages – Linear, Silky, Mellow, Deep, Excited and Toasted – rather than four and you also get every single one of the other features as included in the original including the famous VOS “Stateful Saturation” algorithms, loudness compensated auto gain control, stereo, mono and sum/difference (mid/side) processing options, a frequency magnitude plot and a fully equipped tool bar with undo/redo, A/B options and easy preset management. Dave Pensado said of the original, “This little guy sounds amazing” so it might well be worth your while checking this out if you have an EQ shaped hole in your arsenal. 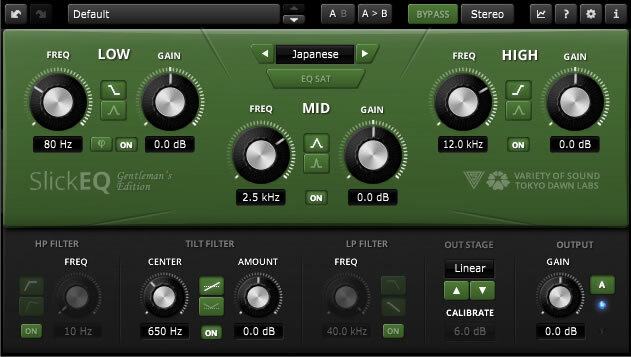 Available now from the Tokyo Dawn Labs website, it cost €30 and is available for Mac OSX and Windows in 32bit and 64bit and in VST, AU and AAX varieties.